The port of ancient Naples (Neapolis) was where Piazza Municipio (photo, right) stands today. The sea extended from the modern square to modern Piazza Bovio (about two hundred meters out of sight on the left of the photo), forming a bay protected by two promontories to the east and west (graphic, below), occupied today, respectively by the church of Santa Maria Portosalvo (well out of sight along the coast line to the left in this photo) and the Maschio Angioino (Castelnuovo) (the fortress on the right). The view in the photo is from a point above the city hall looking south. 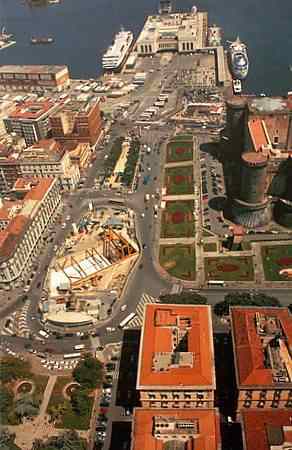 Most of the modern square is where water used to be, and the modern port of Naples extends well out into the sea. (When the Maschio Angioino was built in 1300 it was right at water’s edge.) In ancient times, the port was established on the western side of the bay, better sheltered from western and southern winds. The ancient port shown in the graphic below indicates the point where three Roman vessels (photo, below) were uncovered during excavation for the new metropolitana subway line. That point in the photo (right) is in the lower-left quadrant of the photo (marked by yellow construction equipment and a white tarpaulin). Neapolis was a busy and important port. At the end of the fourth century BC massive dredging had to be carried out in order to keep the port functional. Excavations have shown that a pier of wooden poles and calcareous stones was built at the end of the first century AD, and quays were built as late as the second century AD. The port remained in use in the approximate configuration shown in the graphic for a very long time, well into Byzantine times after the Gothic wars. This is where the ships loaded and unloaded their freight, part of which fell into the sea to become archaeological finds for us. To my knowledge, there is no evidence that even the earliest port at the time of the Greek foundation of the city in 450 BC was ever fed by a stream or river of any sort. Also, it is unclear to what extent the same area was used as a port by the earlier city of Parthenope (indicated in the graphic). It is likely that they used a closer area, that is, directly below the Mt. Echia height where Parthenope was situated. The ships shown in the photo were excavated and removed for restoration and will likely be returned to be displayed in the museum that will form an integral part of the new metropolitana station once it is opened (probably sometime in 2015).